Why Is My Dog's Nose Changing Color? 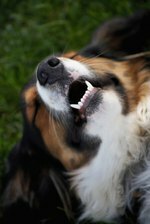 If you close your eyes, you can probably picture your dog's face perfectly. Everything from his ears to the color of his eyes to the texture of his nose is ingrained in your memory. While it might seem that your dog will retain his appearance throughout his whole life, did you know that your dog's nose color can actually change? The good news is that there are many different causes behind dog nose discoloration, and most of them are nothing to worry about. Snow nose, also called "winter nose," refers to a condition where dogs with darker noses experience a discoloration during the winter months. The Natural Dog Company states that white dogs and lighter-colored dogs are most often affected. Because the condition occurs during the winter, some people theorize that it is related to the shortened hours of sunlight. You may notice that your dog's dark nose becomes lighter, possibly turning pink. Sometimes, a dog's nose will still have a darker stripe across it. The outer edges of your dog's nose will stay dark. There is no way to treat snow nose in dogs. According to the American Kennel Club, dogs who experience snow nose generally get the condition year after year. If your dog does have this condition, then his nose pigment should return to normal each summer. The lighter, pink skin will be more prone to sunburn, though, so it's a good idea to put some sunscreen on your dog's nose whenever he'll be spending more than just a few minutes outside. This is particularly true if there's snow on the ground to reflect and intensify the sun. You may notice a change in the color of your dog's nose as he ages. According to Canidae, the enzyme that produces melanin in your dog's skin is called tyrosinase. This enzyme gets weaker as your dog ages, which can result in dog nose discoloration. In some cases, if a dog nose has changed color, a medical issue may be to blame. My Assistance Dog Inc. states that your dog's nose color may change as the result of an allergic reaction called contact dermatitis. Often, dogs are allergic to the plastic in their food and water dishes, so simply changing out the dishes may resolve the issue. Infections can also cause changes in a dog's nose color. If an infection is present, you'll often see other symptoms including redness, discharge, swelling, and crusting around your dog's nose. Other causes include lupus, skin cancer, or vitiligo, an autoimmune condition that often causes your dog to develop white patches on his coat. Even trauma or injury like a scrape to your dog's nose can cause color changes, and your dog's nose may appear pink or red as the injury heals. Most often, a change in color on your dog's nose is nothing to worry about. There are many different causes behind pigmentation changes. If your dog is otherwise healthy and happy, you probably don't need to be concerned. However, if you notice that your dog is not feeling well or develops other symptoms in addition to the pigmentation change, it's time to get him to a vet. Your vet will take a medical history, examine your dog, and may run some tests to make sure that there's no underlying medical issue. Do Light-Colored Dogs Have More Skin Problems? How to Tell If Your Puppy Is a Blue Nose/Red Nose Pitbull? Why Is My Dog's Skin Turning Black Under Her Leg Creases?